When a card calls on you to sacrifice a character, can you use Magneto: Will to Live? Sacrifice says the die goes to used, but Will to Live makes him skip that and go to prep. Would the sacrifice fizzle? 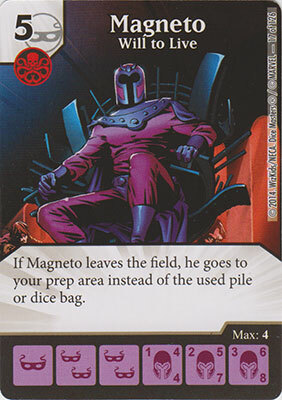 Or would Magneto's ability mean you could use sacrifice and still get him back? Sacrifice and get him back. He may see a resurgence with this new mechanic. There may be those that say, since sacrifice is a cost, you can't avoid paying it by moving Magneto to the used pile. However, don't let them bully you into that thought, you are still paying the cost, it simply isn't as harmful when you do it with Magneto. Similarly, paying the cost to activate the blue-eyes global isn't as costly when you do it with a regenerating troll. Good combination of game mechanics does not avoiding a cost make.